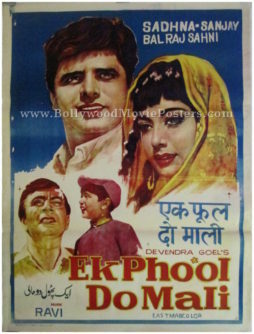 Old Bollywood poster of the memorable Hindi film Ek Phool Do Mali (1969) for sale. Featured here for sale is a vintage Bollywood poster of the 1969 Hindi film that starred Sanjay Khan, Balraj Sahni and Sadhana Shivdasani in lead roles. Inspired largely from the Hollywood classic Fanny (1961), Ek Phool Do Mali went on to establish itself as a moniker of sorts to describe a love triangle in India. Printed and circulated a few years after the original release of the film (somewhere in the 1970s), this old Hindi movie poster was originally designed for publicity of the film but never ended up being used. This old Bollywood poster features quirky hand painted artwork and was designed originally on canvas in Delhi by a small time art studio. Large hand painted faces of the lead couple Sanjay Khan and Sadhana Shivdasani are seen prominently in this vintage Bollywood poster. Balraj Sahni is seen in a smaller rendition at the bottom of this old movie poster. The artwork style is very typical to hand drawn movie posters designed in Delhi.